"I Ain’t to the Quittin’ Place!" It’s not unusual to walk into any cafe in Texas, in the early morning or late afternoon hours, and find a table full of older men drinking coffee, laughing and swapping stories. The Hwy 6 Café, in DeLeon, Texas, is no different. Charles Chupp, a 78-year-old man with the look of a weathered cowboy and the soul of a poet, can often be found at these gatherings, and while he does his share of talking, those who know Chupp well know it’s when he’s listening that he’s happiest. 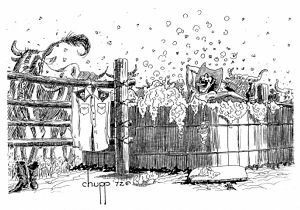 Because once the other coffee drinkers go back to their ranching, farming, or desk jobs, Chupp will often times head home with enough material for another edition of his “Got No Reason to Lie” column. Those columns, peppered with homespun humor and wisdom, Latin phrases, and the occasional French curse word, have been a featured addition to the local newspaper since the early 1980s, when Chupp moved “back home” to DeLeon after working and raising his family in West Texas. When he’s not writing about the comical mishaps and antics of his friends, he often writes about his own hardscrabble childhood in rural DeLeon. He’s also devoted many hours to writing about his life and the experiences that came between that childhood and these “coffee years” including 35 years as a right-of-way negotiator for a major electrical supply company. Of course, an observational humor column is not the ideal fit for all narratives, and through the years Chupp has used many different means to share his talents. He’s published six books, a magazine, and, for five years in the 1990s, a newspaper. Interestingly enough, Chupp’s also gifted in other mediums and is, in fact, a well-known artist. Although much of his art work has a western touch, he’s equally adept at more traditional pieces, and much of his work grace homes, businesses and galleries across Texas. He and a friend, Harley Murray, were the founding members of The Texas Wild Bunch, a group of independent artists who joined together in the 1970s and “showed everywhere there was a shade.” According to Chupp, the group was formed because galleries kept going up on their commissions. Chupp said that eventually, two of the members were named State Artists – George Hallmark and George Boutwell. “Boutwell’s still in the Bunch,” Chupp said. “He’s running it now. They bestowed old Harley and me with lifetime member status, because we’re so old,” he laughed. 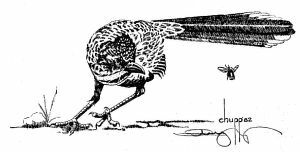 Chupp also free-lanced cartoons, and punch lines for other cartoons, in his younger days. The Walt Disney Company thought Chupp showed promise, and encouraged him to contact them again when he turned 21. But by then, he was married, and in the military, and never gave it any further consideration. Although he doesn’t remember all the places he’s been published through the years, a more recent one really stands out in Chupp’s mind. “I wrote for the New Hampshire Gazette,” he said, explaining how he’d “beguiled” the publisher to print his pieces. “I read somewhere that it was the oldest newspaper ever published in America that was still in print. And my friend Fred Turner was going to New York, so I told the old boy up there that I was going to send my agent by.” The articles Chupp submitted, political pieces, were published several times. Chupp noted that Turner, a friend for the past 16 years, handles all his computer and Internet needs, including the prep work for the book publications. Even though Chupp’s columns are filled with small town vernacular and colloquialisms, he’s actually a very well-educated and well-read man, and will occasionally throw in a word or two that has readers running for their dictionaries – just to make sure people are paying attention. Chupp said that two stints in the U.S. Army put him through college. 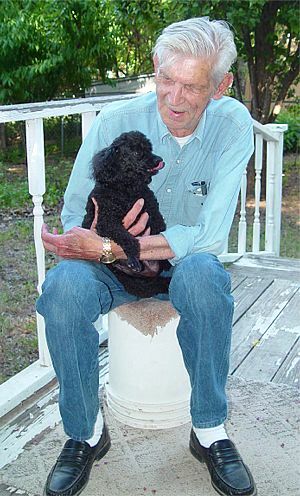 Born in 1929, Chupp likes to say that his parents, Hugh and Thelma Chupp, didn’t blame him for the Depression, nor the Depression for him – and that they went on to have two more children, John Franklin and Benny Wayne. His most recent book “Frankly Speaking” focuses on his early childhood, particularly his brother John Franklin. Many of Chupp’s preferences and beliefs make him more interesting than the people he writes about. He never eats meat, but says that is not for religious or health reasons – he’s just never liked the thought of eating animal flesh. He also never reads a finished piece of writing, after it’s published, and he tries not to look at his art work again. “When I finish writing a book, I never look back at it,” Chupp said. “And I never really look at my pictures again, because once they put it behind glass, or in a frame, there’s nothing else I can do, and I don’t want to see it.” Chupp confessed that he often finds himself wishing he could make changes, and, of course, by then it’s too late. So once he “lets go” of his creations, he never looks back. In addition to writing and painting, Chupp served as DeLeon’s mayor during the 1990s, as well as serving on the school board. It was during that time that he also published a newspaper, DeLeon’s Monitor, as well as a regional magazine, The Messenger. Both publications were family efforts, and the resulting Texas Press Association awards still grace Chupp’s wall. Now that he’s retired from publishing (after having already retired from the electric company), and sold the newspaper and magazine, and cut way back on any art work, Chupp said that except for the column and books, his family and dog Butterfly, are the focal points of his life. During their 50 plus years together, he and Margaret had two children, Ace and Tracy; three grandchildren, Taylor Anne, Mercedes and Audrey; and two great-grandchildren, Angel and Alia. 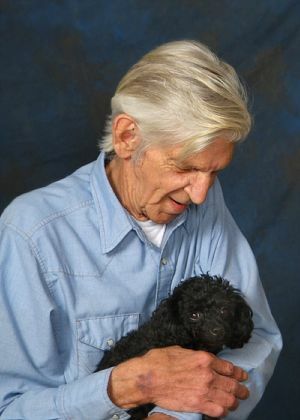 Butterfly was Margaret’s beloved pet poodle, and brought much comfort to the couple during Margaret’s struggle with Alzheimer’s. Butterfly is now Charles’ constant companion. “I don’t really know if being able to write is a blessing or a curse,” Chupp said recently, “but it’s all I think about. Once I get an idea, the only way to get rid of it, is to write it. It bugs me in my head.” When asked about his plans to retire completely, Chupp’s answer was a simple one. “I ain’t to the quittin place yet.” And Chupp fans everywhere, breathed a sigh of relief.